Montana River Anglers is your premier Montana trout fishing guide and outfitter for fly fishing on the Flathead river, near Glacier National Park, and from Whitefish to Missoula. We fish some of the most pristine rivers in the country, guiding our guests to the best fly fishing in Montana. The outfitter, Jim Voeller, is a native Montanan who has been fly fishing Montana rivers for more than thirty years, and has been guiding fly fishermen on these rivers for over twenty years. He is pleased to offer guided fly fishing trips on Montana’s best trout streams, including his home water, the unforgettable Flathead river. Jim says of his guides: “they are not only Blackfoot river guides, Flathead river guides, or Montana fishing guides, but personal friends of mine whom I fish with in my spare time. That means that these folks share my ideas of what it takes to provide a great fly fishing experience.....patience, knowledge, communication skills, ability to teach .... to name a few”. We use top-of-the-line and state-of-the-art boats and equipment to ensure that our guests are comfortable and safe on their trip. Most of our float trips are taken in the comfort and class of drift boats, offering the angler a stable casting platform as well as access to the best water. 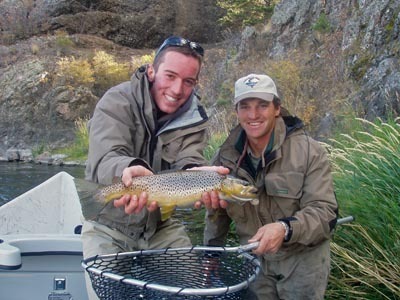 Montana River Anglers provides guided fly fishing trips on many of Montana's beautiful rivers and streams. We've mentioned some of the popular ones here, but there are many more to choose from. 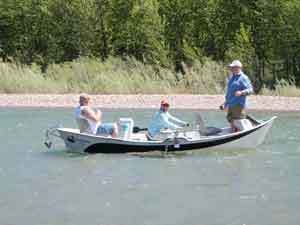 Give us a call to find the right stretch of river for your Montana fly fishing vacation.